For more information on the service please see our video, advice or popular questions below. Information about landlord responsibilities (PDF 286KB) for managing waste. More items, like clothes and drinks cartons, can be recycled at recycling points across the city and at our two recycling centres. Find out about manufacturers responsibilities, and how you can report problems to trading standards about waste packaging problems. You can see a written description of the how to recycle video by opening the how to recycle video transcript (PDF 40kb). Ensure a collection by placing your boxes or bin on or by the pavement, at the front of your property. Please leave your recycling out the night before your day of collection or by 6am on the day. Please remove your boxes from the pavement after collection to stop them blowing away or litter being dropped in them. If you are elderly, disabled or are for any other reason unable to put your box by the pavement for collection please fill in our assisted collection form. We can then discuss setting up a collection service from an area best for you. Over 80% of prroperties across Brighton & Hove receive a recycling collection. Each crew collects from around 800 properties every day. 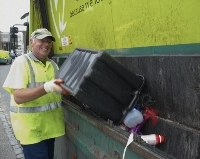 This means that all the recycling crews collect from a total of around 12,000 properties every day! What happens to your recycling after it is collected? You can see more questions and answers on our recycling frequently asked questions. Check our contact page for information on contacting us by phone or email.